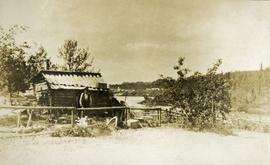 Photograph depicts a rustic log cabin, shed and garden fence near the edge of a lake. The surrounding landscape is low rolling hills. 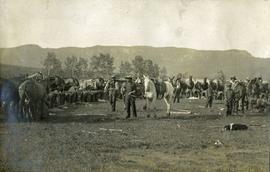 Photograph depicts roughly cleared land in the foreground, canvas tents and a wagon in the midground, lake and hills in the background. Photograph depicts several men posing for a photograph. Cooking utensils, fire pit and hitching posts in the foreground. Trees in the background. 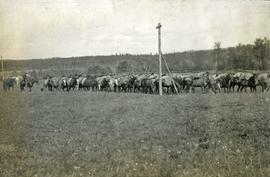 Photograph depicts a long line of 30 or more horses or mules and men. The horses appear to be tethered to a rope, some animals are wearing packs. Several men attend. 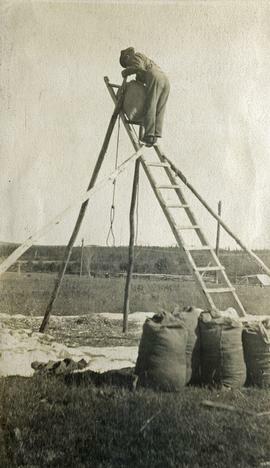 Photograph depicts a man standing on a high ladder pouring grain from a sack to a tarp below. Sacks of grain in the foreground, field and trees in the background. 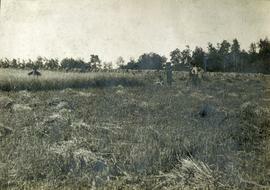 Photograph depicts five men standing in a field of cut hay. Some men are holding scythes, buildings, forest and rolling hills in background. Photograph depicts a scow loaded with three or more pack horses with men attending. 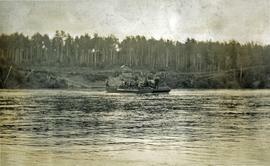 The scow is crossing the river, guided by a cable. There is one building, and forest in the background. Photograph depicts a man standing near a rough log shed. A fence line leads toward a lake. A small settlement and treed hills in the background. Photograph depicts a man standing near a fenced garden plot is nearby. 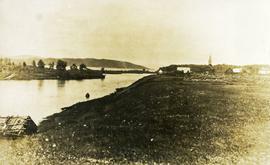 A body of water, a small settlement and treed hills in the background. 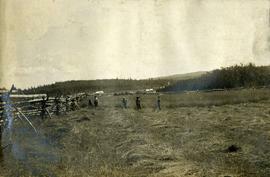 Photograph depicts rolling fields with a newly ploughed area in the center of the image with forest in the background. 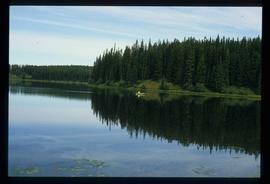 Image depicts the Fraser Lake. 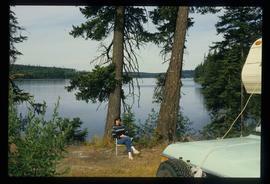 Image depicts Sue Sedgwick by the Fraser Lake. 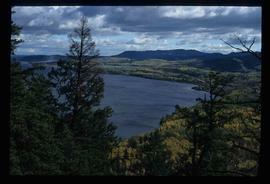 Photograph depicts roughly cleared land in the foreground, a lake and rolling forested hills in the background. 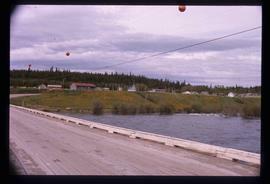 Image depicts a view of the Fraser Lake. 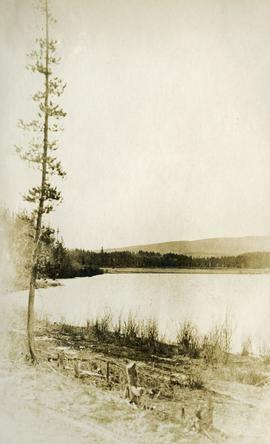 Photograph depicts the lake from the water's edge. Low forested hills in the background. 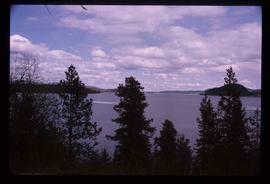 Image depicts a view of Fraser Lake. 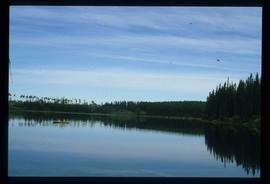 Image depicts a canoe on the Fraser Lake. 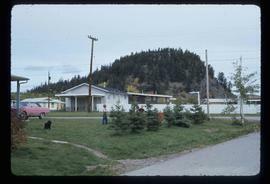 Image depicts a group of children playing a yard in Fraser Lake, B.C. 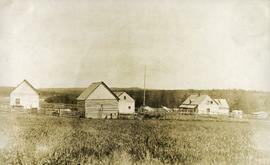 Image depicts a few buildings in Fraser Lake, B.C. 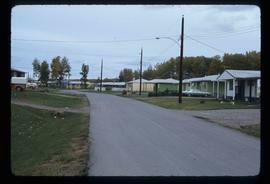 Image depicts a row of houses in Fraser Lake, B.C. 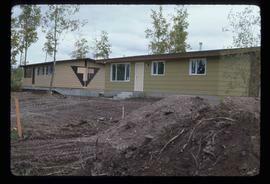 Image depicts a couple of houses in Fraser Lake, B.C. 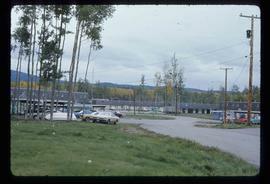 Image depicts the old Hudson Bay Trading Post in Fraser Lake, B.C. 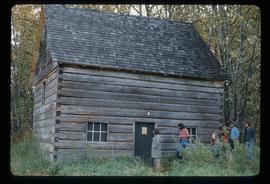 Image depicts the old Hudson Bay Trading Post with several unknown individuals present in Fraser Lake, B.C. 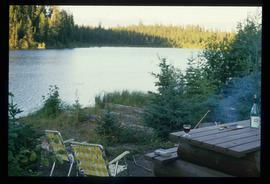 Image depicts a cabin at Fraser Lake, B.C. 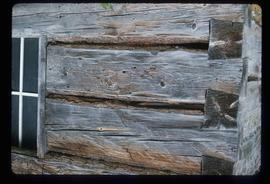 which is labelled on the slide as an example of a "square log" dovetail joint. 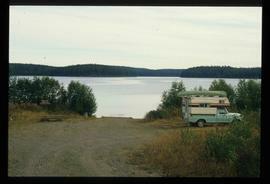 Image depicts a view of the Fraser Lake from the Fraser Lake campsite. Photograph depicts view from behind the ferryman and ship's wheel. 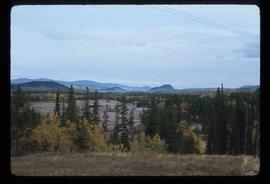 Fraser Lake and treed hills in the background. 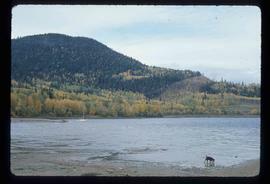 Image depicts a view of the Fraser Lake skyline. 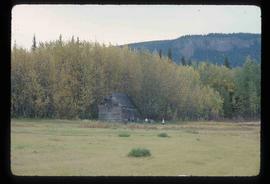 Photograph depicts a view of the Fraser Lake ferry house from a distance. 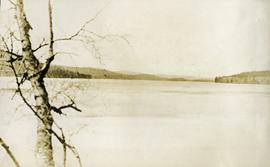 Photograph depicts a lake. Photograph is framed by a deciduous tree on the left. Forest and rolling hills in the background. 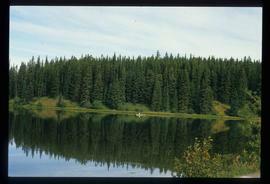 Photograph depicts treed rolling hills near Fraser Lake, BC. Photograph depicts a cluster of seven or more buildings, fences and a flag pole. A grassy field in the foreground, rolling hills in the background. Photograph depicts ten men standing on a boardwalk outside a large building. Another building, boardwalks and fences nearby. Forest in the background. The buildings are constructed from lumber. 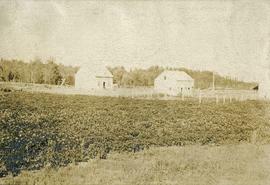 Photograph depicts buildings, field, and fenced areas with forest in the background. 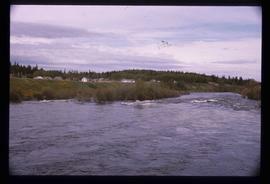 Photograph depicts a cluster of buildings near a river or lake. A fence and grasses in the foreground. Photograph depicts three or more men near a wagon loaded with supplies. 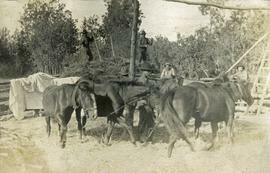 A team of two or more horses are hitched to the wagon. Lake and rolling treed hills in the background. 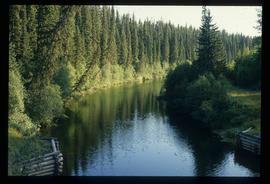 Image depicts Nautley and the Nautley River near Fraser Lake, B.C. 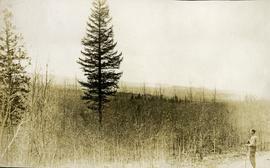 Photograph depicts a man standing on the edge of a trail looking to the treed hills in the distance. Photograph depicts twelve or more horses loaded with packs. Three or more men attending. There is a telegraph pole in the midground, treed low hills in the background. The horses are standing in a field. 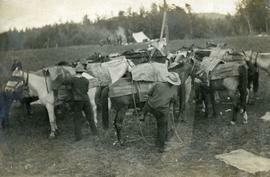 Photograph depicts a group of horses in process of being loaded with packs. Four or more men attend. There is a canvas tent, open fire and more people in the background. 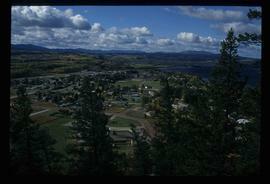 Proposed Roadway & Public Road Crossing at Nechako Sub. 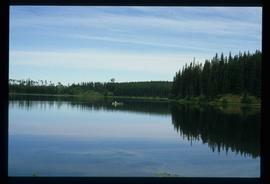 Mile 108.35 - Fraser Lake, B.C. Blueprint showing plan for proposed railway crossing and road in Fraser Lake, B.C. Property lines are shown, as well as a detail of the road curve. Photograph depicts a large semicircle of tethered horses. Loaded packs are arranged near each horse. Men, boys and a border collie are in the foreground, low mountains in the background. Photograph depicts six horses harnessed to a center pole. Three men attend the horses, two men with pitchforks stand atop a wagon loaded with cut grain stocks in the background.